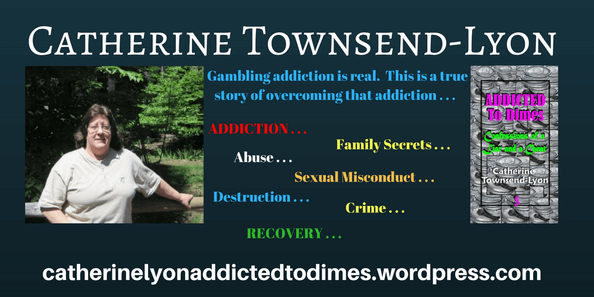 Author bio: Catherine Townsend-Lyon is the best-selling Author of her shocking debut Memoir “Addicted To Dimes, Confessions of a Liar and a Cheat. She has fast become well known in the addiction & recovery communities. Her book shares her raw, unedited and haunting past of gambling addiction, living with mental health challenges, a childhood trauma, and abuse survivor, as she helps many in recovery and advocates about these important issues to Shatter Stigma, Raise Awareness, and Educate the public, and those who have been ‘touched’ by the same. Her mission is to spread HOPE to others looking to recover and warn that suicide is not an option or answer for someone with a gambling addiction. Professional Speaker Topics: Gambling Addiction Recovery, Living with Mental Health challenges maintaining recovery, Relapse Prevention, Recovery Service. My 2nd Passions are writing all things literary marketing and your brand as an author and writer.